A relatively large coastal preserve for coastal Connecticut at over 800 acres, Bluff Point offers extensive hiking opportunities with scenic views of the ocean. A one mile hike brings you to small beaches and coastal bluffs. A trail along the Northeast Corridor train tracks leads to the trails in the adjacent Haley Farm State Park. This KMZ map is set to Draw Order 40 so it will show 'beneath' your primary map but above my map of Haley Farm State Park on your Garmin KMZ-compatible GPS. 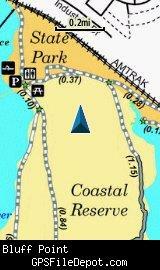 The image on the left is from a Garmin GPSMAP 78sc with no other maps displayed. 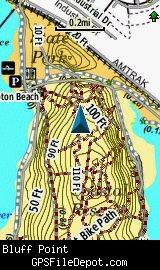 The center and right images are from the same device with the Garmin 24K NE series TOPO map displayed. 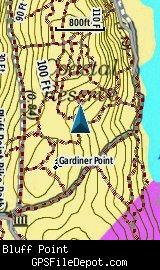 Note that the Garmin 24K TOPO map has MORE trails for this property than my KMZ map has. Initial release using CT DEP map dated August 20, 2009.